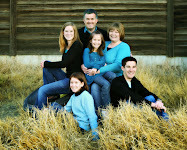 The next year in the Tom and Terri Moon Family. AND now behold, in the twenty-first year of the Tom and Terri Moon family, they did pack up their lamps and their Rubbermaid and their not so precious things and they did travel for the space of five minutes to their house that was built upon the rocks. 2 Now, Cameron did grow in his testimony of the gospel. Yea, he did desire to teach the good word. Therefore, he was called to the land of the mouse and the mighty winds. And he did seek after those who desired to know the truth. Yea, he did rejoice in those who were converted and entered into the waters of baptism. 3 And it came to pass, Courtney's afflictions were sore, for she did depart from her old school and friends to the great and spacious building that was the new school. Yea, she did not march in the wilderness, and her sorrow was great. And yet, she delighted in her stature, for she did grow taller than her father. 4 And it came to pass, Maddy continued in her love of volleyball, yea she did increase in her power in setting and bumping. Therefore, her opponents did durst not give the ball unto her. And she being thirteen has been heard to say, "Oh, woe is me. Why must I be subjected to this, my family?" 5 And it came to pass, Kenna did heed the prophet's council, yea she did pierce her ears with one hole, and she wept not. And she delighted in serving others. 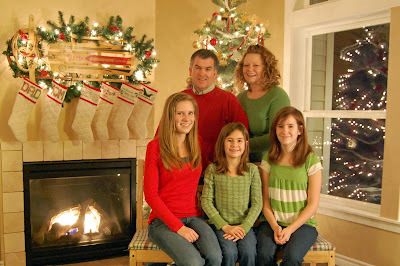 Therefore, her friends were many, and her family found joy in her service. 6 And it came to pass, that Tom and Terri did strive to hold on to the rod, notwithstanding the adversities of old chariots, church callings, and unfinished basements. 7 And behold, it came to pass that we did rejoice and be merry, yea; we did give thanks unto the Lord for the many blessings that have been bestowed upon us. Yea and we did pray for his blessings to be upon you. 8 And again we make an end of writing concerning these things for a time. 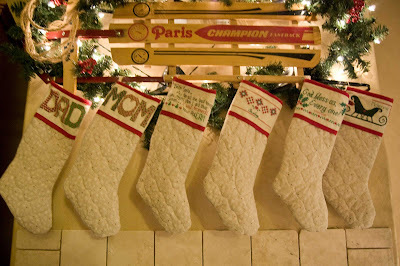 Anyway, the first Christmas we had Cameron, I decided to make stockings for our little family. I remember staying up very late Christmas Eve sewing them together. 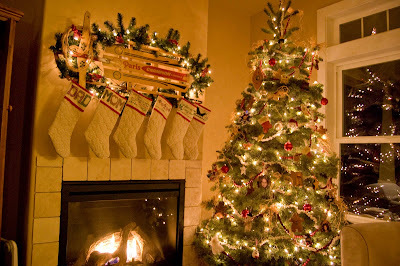 Every time we added a new family member, I would make a new stocking for her. 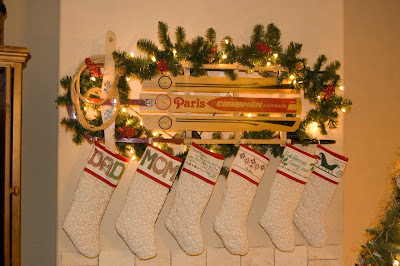 I had visions of a gorgeous fireplace mantle that would one day be the perfect spot for these stockings. 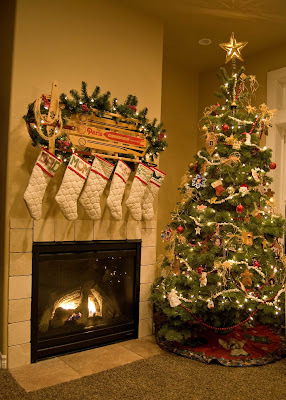 When I stared at the blank wall where I knew I wanted to put the stockings, I happened to glance at the sled Tom had brought in with the rest of the Christmas bins. I decided to try something a little unusual. Before I could even finish my thought, my sweet hubby was in his car heading to Lowe's to get the stuff to make my idea a reality. A couple of hooks, some garland I had, and some dollar store picks were all I needed to make something I really love! 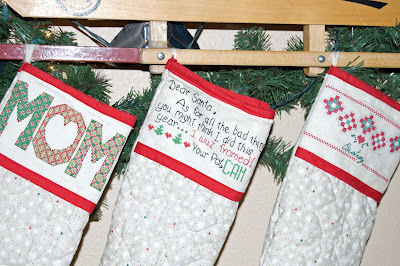 A closer look at the stockings. Did you know popcorn will last forever if you put it in an airtight container and store it in the attic, storage unit or garage? We realized, as we were decorating our tree this year, this popcorn string is at least fifteen years old. It was hard work! But worth it.